Water Heaters . . .
Pespisa Company Installs and repairs water heaters same day! Have an electric water heater? Start saving with a new heat pump style and get rebates too! For customers who have electric hot water heaters Pespisa Company recommends the General Electric Geospring water heater. Geospring water heater is estimated to use less than half of the electricity of a standard electric water heater and it can save you over $300 a year! Call us now to find out more about the current rebates and savings! Does it take too long for your hot water to reach certain fixtures in your house? Have a recirculating hot water system installed and have hot water instantly at all fixtures! A hot-water recirculating system keeps the hot water just feet away from all of your fixtures. Having the hot water closer to a faucet means that you do not have to wait for the hot water to come all the way from the water heater in the basement to your faucet or shower on the 2nd or 3rd floor which can take multiple minutes in some homes. As well as providing you with hot water more quickly, a recirculating system will save water because you will not be wasting all that water while you are waiting for it to heat up. Call now for free consultation on a hot-water recirculating system! Want to go tankless? Save money and never take a cold shower again! Tankless water heaters like the rinnai wall-mount unit can greatly reduce the cost of heating your hot water and give you and your household virtually endless hot water. 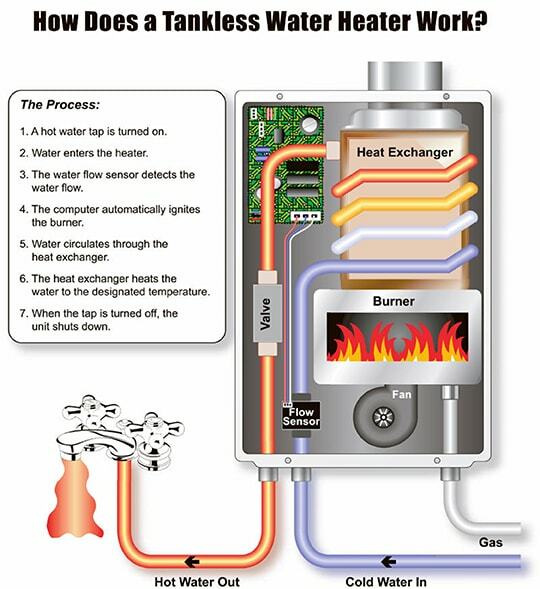 A tankless unit works like a high efficiency condensing boiler. It has a coil inside it instead of a tank. When the hot water is turned on, a flame heats the coil and the water rushing past inside as well. These tankless water heaters have higher efficiency, around 96% compared to a traditional water heater that is only around 60% efficient. Have a plumber replace your anode rod every 2-3 years. The anode rod in a water heater is made of a sacrificial material which has a higher negative electrochemical potential. This higher potential attracts corrosive hydroxides which form in water. In essence the anode rod sacrifices itself to become corroded so that the inside lining of the tank does not become corroded and leak. Replacing the anode rod on your tank can extend its life greatly, especially in areas of highly corrosive water. Flush your water heater every 6 months to clean out any build up of sediment and rust which may occur in the bottom of the tank. Consult a properly licensed plumbing professional before doing this. The brand of tanks we carry are Bradford White, but we can purchase and install just about any brand the customer chooses if there is a preference. We like Bradford White because they are reliable, they have good hot water output, and they are affordable. ” Punctual, Efficient, capable, hard working!